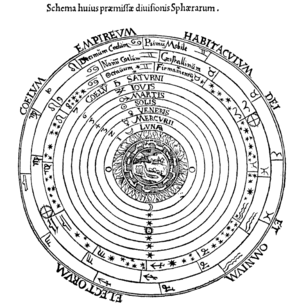 Rendition of a geocentric system from the Middle Ages. A Geocentric theory is an astronomical theory which describes the universe as a Geocentric system, i.e., a system which puts the Earth in the center of the universe, and describes other objects from the point of view of the Earth. The Greek philosophers Aristotle and Plato described such a theory wherein all celestial bodies move on spheres around the earth, the moon on the innermost one and the fixed stars on the outermost one. Ptolemy invented the most elaborated geocentric system, allowing the planets not only to move on circles around the earth, but using epicycles. By adding further ideas, he was able to predict the motion of the planets quite well. Ptolemy's model was extremely popular from ancient times until the 1600s, as it had better agreement with observation than any alternative. His model was particularly effective at cosmological predictions. However, during the 1500s and 1600s, alternatives were proposed. The Danish astronomer Tycho Brahe made the most accurate observations possible before the invention of the telescope. These showed discrepancies within Ptolemy's system. With the invention of the telescope, the observations became more precise, and new phenomena were discovered: In particular, Galileo's use of the telescope to look at the skies revealed that Jupiter had at least four moons, and Venus had phases like the Moon: both phenomena were not predicted by Ptolemy's model. Johannes Kepler used Brahe's measurements to improve the heliocentric system Copernicus had proposed, showing that planets had elliptical orbits around the sun. When Isaac Newton applied the newly discovered universal theory of gravitation to the data, he used a heliocentric model. By the 1800s, the spectacular successes of Newtonian theory and Maxwell's equations for electromagnetism had convinced practically everyone that the Sun is a preferred frame of reference, and that the laws of physics must be applied in that frame. The geocentric theory was considered to be profoundly mistaken at that time. One can set the origin of one's perceived coordinate system however one likes, but experiments can be performed that can distinguish the various theories. One could set the origin of the Universe to be the 5th car of the Tilt-a-Whirl at Six Flags New Jersey, and work out the detailed equations of motion based on that hypothesis. But experiments involving centrifugal and Coriolis force would quickly refute that. There are more sensible choices of the center of one's coordinate system, and they each have their uses. At some level of precision (fastening your seatbelt) a coordinate system fixed on your car is satisfactory. At some higher level of precision (driving your car) a coordinate system fixed on the Earth is satisfactory. At some higher level of precision (guiding a spacecraft to the Moon) a coordinate system fixed on the Earth's position, but not rotating with it, is satisfactory. At some higher level of precision (guiding a spacecraft to another planet) a coordinate system fixed on the Sun's position is satisfactory. In each case, experiments can be performed to reveal the correctness of the system. More sensitive tests are needed as the precision increases, but tests can be performed showing that geocentrism is not correct. These tests were unknown at the time of Kepler, Copernicus, and Galileo; they formulated their theories on considerations of logic and astronomical observation. These considerations have essentially nothing to do with the theory of relativity. They relate to what is known as Galilean relativity, which is just pre-Einstein common sense. The only significant implication, and the effect is extremely tiny, is the precession of the various planets, particularly Mercury. Galileo never proved that Earth orbits the sun, and modern science acknowledges this. While most are aware that Galileo was forced to recant Heliocentrism by the Inquisition, a lesser-known fact is that he wrote a voluntarily recantation of his own accord, several years later. Geocentrism and modern physics (Newton's laws) are totally at odds with one another. Even granting that the barycenter of the Solar System is near the sun, and that the universe has a barycenter (which requires that the universe be finite), one could posit that the barycenter of the universe is at the Earth, or at the barycenter of the solar system. However, it would, in the former case at least, be very easy to observe evidence that this would make the various planets behave in a manner not consistent with Newtonian mechanics. It is very easy to disprove geocentrism, using astronomical observations and the application of known physics principles. That the ancients believed in geocentrism is not surprising, considering their state of scientific knowledge. They had no idea of what relative motion meant, or how Galilean relativity worked. While those notions are totally discredited in the modern world, the terms "sunrise" and "sunset" still pay homage to them. To a person standing stationary relative to the Earth, these terms make complete sense. For those on Earth, the Earth would be the most convenient location to assume as fixed. Geocentric terms, therefore, do not necessarily implicate geocentrism. But, of course, anyone who has graduated from elementary school knows that they are just metaphors. In reality, scientists acknowledge that the Sun (more precisely, the Solar system's barycenter) is not fixed, but rather rotates around the galaxy. Because we do not know what points are actually fixed, motion is always measured as being relative to another body. Not surprisingly, notions involving geocentrism permeate the Bible. There are a number of Bible quotes that use geocentric terms. While some people attempt to use these quotes to discredit the Bible's veracity on scientific subjects, most people dismiss these objections, pointing out that this usage is similar to the way people today—even scientists and meteorologists—use terms like "sunrise" and "sunset" in their vocabulary. In this account, the terminology is not wrong, but merely reflects the observer's view. ↑ The Accuracy of Galileo's Observations and the Search for Stellar Parallax. ↑ Le Opere Di Galileo Galilei. ↑ Faulkner, Danny R. (August 1, 2001). Geocentrism and Creation. Answers in Genesis. Retrieved November 22, 2016. This page was last modified on 9 April 2019, at 09:14. This page has been accessed 142,857 times.